Been to a major American sporting event lately? If not, consider yourself fortunate. The NFL and NASCAR are already over-the-top when it comes to manufactured noise, exaggerated pyrotechnics, and wall-to-wall corporate advertisements. Even my beloved sport of baseball has fallen victim to sensory saturation and techniques of crowd control that would make a dictator proud. The grace and spontaneity of America’s pastime is increasingly lost in Jumbotrons, overly loud and canned music, and choreographed cheering. With all the Jumbotrons and other video screens everywhere, people are no longer focused on the game as it takes place on the field, and perhaps turning to their neighbor for an explanation if they miss a play or nuance. Instead, people look to the screens to follow the game. 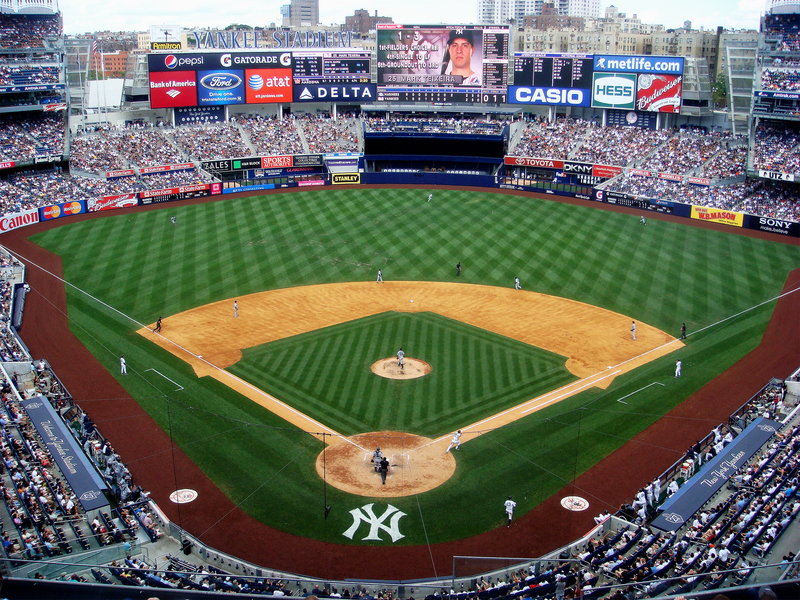 Indeed, sight lines at some seats at Yankee Stadium are so poor that the only way you can watch the action on the field is on video screens posted at strategic locations. Mediocre seats are $110 each, and an $11 beer only compounds the pain. Attending a Yankees game “used to be something of a social leveler, where people of all classes would come and meet to support the team… Although the place was packed for a Red Sox game, it was a largely white crowd, looking nothing like the mix of people who actually inhabit New York,” my friend concluded. I share my friend’s concerns. I hate being coerced by screens and speakers telling me when to cheer and what to say. Even at my local Single-A baseball games, the post-game fireworks are set to music, usually of a patriotic tenor. I’ve got nothing against music, but why can’t I just enjoy the fireworks? I don’t need “Proud to be an American” blaring to make me proud to be an American. But it seems like many fans are happy being told when to cheer, what to say, even what to feel. Or they’ve simply become accustomed to being controlled, which has the added benefit to owners of suppressing any inconvenient spontaneity. More and more, our senses are saturated so we cannot pause to converse or even to think. If the game grows tiresome, people turn to cell phones, palm pilots, and other personal technologies for stimulation. And the phenomenon is hardly limited to sporting events. Today’s version of “Sesame Street” is an exercise in frenetic action and hyperkinetic stimulation; one wonders whether it’s designed for ADHD kids, or to create ADHD kids. More and more, we’re surrounded by and immersed in near-total sensory saturation; the stifling effect such an environment has on individual spontaneity and thought can’t be disregarded (nor can it be accidental). And it appears in the most unlikely of places. I used to watch air shows at the U.S. Air Force Academy. Few things are more viscerally thrilling (or chilling) than a formation of F-16s screaming overhead. But that effect apparently wasn’t enough. The powers-that-be “augmented” the air show with loud rock music (call it the “Top Gun” effect) along with an especially annoying (and superfluous) narrator. There was even a proposal to add huge video screens and even bigger speakers to the performance until it got shot down due to charges of contractual cronyism. Bigger, faster, louder doesn’t always mean “better.” Whether it’s an air show or ball game today, we seem saturated by noise, video images, and other sensory distractions, often advertised as “necessary” to broaden the appeal to non-fans or casual spectators who simply want to feel that they’ve witnessed a spectacle, whatever its meaning. It’s hard to develop an inner life when you’re constantly plugged-in and distracted. It’s also hard to take independent political stances when you’re constantly bombarded by infotainment, not just in the mainstream media but in the sports world as well. I don’t care about off-field shenanigans or contract disputes or manufactured grudges between teams, nor do I want to watch pre-game and post-game shows that last longer than the games: I just want to watch the game and marvel at the accomplishments of world-class athletes while cheering for my home team. Sports have always been a form of entertainment, of course, but today’s events are being packaged as life-consuming pursuits, e.g. fantasy football leagues. And if we’re spending most of our free time picking and tracking “our” players and teams, it leaves us a lot less time to criticize our leaders and political elites for their exploitation of the public treasury – and betrayal of the public trust. I wonder, at times, if we’re heading in the direction of “Rollerball” (the original movie version with James Caan), in which a few corporations dominate the world and keep the little people (you and me) distracted with ultra-violent sports and hedonistic consumption, so much so that people can’t recognize their own powerlessness and the empty misery of their lives. Until our sporting events and air shows return to a time when players and fans and enthusiasts collectively showed up simply for the love of the game and the purity of it all (and I can hear my brother mischievously singing, “Until the twelfth of never”), count me out. I can be more spontaneous in my living room with friends — and the beer sure is cheaper. Update (4/1/2015): Chicago’s Wrigley Field is a vintage ballpark with a lot of character. So how do you ruin some of that? By installing a massive Jumbotron. 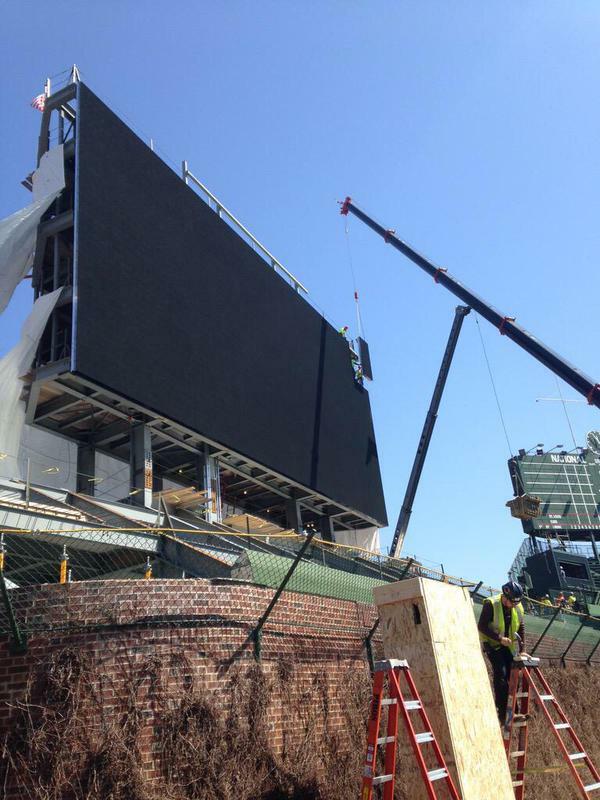 They still haven’t finished the bleachers, but they have the humongous TV glaring and dominating the skyline in left field. Error, Cubs.